There are some games where the date becomes permanently etched into memory. When the teams involved are scheduled to play on or near the anniversary of that date, in the same arena, the memories return. 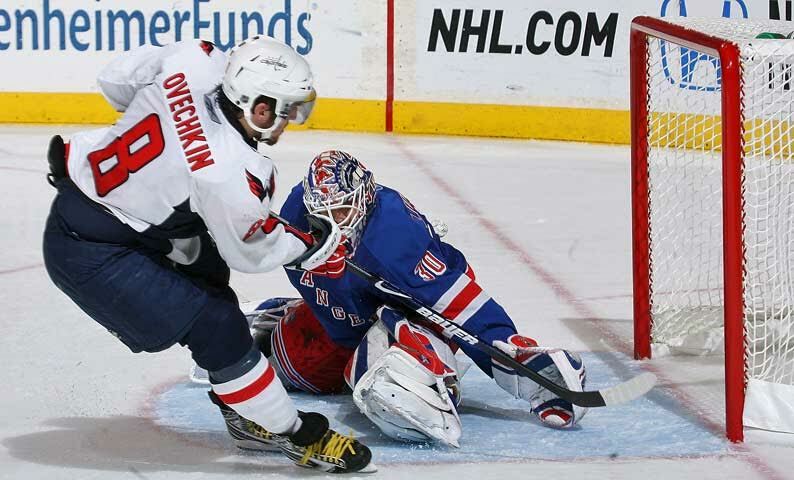 One of those games was one that involved the Washington Capitals and the New York Rangers on December 23, 2008. It would be both teams’ last game before Christmas break. At the time of the contest, the New York Rangers were leading the Atlantic Division but being threatened by below by the New Jersey Devils and the Philadelphia Flyers. The Washington Capitals had a substantial lead in the Southeast Division and had lost their most recent game to the Philadelphia Flyers, which had snapped a 5 game winning streak. The Capitals had a very long injured list which included Alexander Semin, Sergei Fedorov, Mike Green, Jeff Schultz, Tom Poti, and John Erskine. This included FOUR of their regular defensemen. As a result, their top defensive pairing for that game was Karl Alzner, a rookie called up from Hershey at the end of November, and Milan Jurcina, who normally played on the third pairing. The rest of their defensive corps consisted of Shaone Morrisonn, who was usually on the top pairing and three other callups from Hershey, Tyler Sloan, Bryan Helmer, and Sean Collins. The Rangers opened the scoring at about 3 ½ minutes into the contest, with a goal by Marcus Naslund. Just after the 11 minute mark, the Rangers scored two more goals in VERY quick succession, one by Michal Rozsival and the other by Ryan Callahan, with team captain, Chris Drury assisting on both. That made the score 3-0. Given that Caps’ starting goalie, Jose Theodore, had given up his 3 goals on only 5 shots, Caps’ coach, Bruce Boudreau figured it was time to change goalies and substituted Brent Johnson for Jose Theodore. Fortunately, for the Caps, Johnson stopped the 3 shots the Rangers directed at the net for the remainder of the period. However, Johnson was unable to return to the game for the next period, given that he was both sick and dealing with a hip injury. Hence, Theodore was back in goal. The Rangers added another goal between 4 ½ and 5 minutes in the period, on the second goal of the night by Ryan Callahan. So now the Caps were down 4-0 and things looked very bleak in Madison Square Garden for the visitors. But the tide started to turn at about 12 ½ minutes into the period. Alex Ovechkin scored a goal to break the shutout. Up until that point, Ovechkin had not been particularly successful in Madison Square Gardens, having scored only once there prior to that goal. The score remained 4-1 at the end of the second period. Early in the third period, after the Caps had finished killing off a penalty, Michal Rozsival hooked Tyler Sloan and Tomas Fleischmann scored on the ensuing power play to make the score 4-2, less than 2 minutes into the period. Then, just after the 6 minute mark, Blair Betts of the Rangers kneed Nicklas Backstrom, resulting in another Caps’ power play which also proved successful for the Capitals, with Viktor Kozlov scoring the power play goal, making the score 4-3. Just after 12 ½ minutes, Alex Ovechkin scored another goal, tying up the score at 4 apiece. No more scoring occurred during the third period so the game proceeded to Overtime. A shade less than a minute into Overtime, Caps’ defenseman, Shaone Morrisonn scored, with assists from Michal Nylander and Sean Collins. The Caps were now winners, after being down 4-0 at one point. Incidentally, this particular game was Morrisonn’s 26th birthday so that a great way for him and his team to celebrate. Post game, a jubilant Ovechkin said, “They stopped playing hockey. They probably believed 4-0 they’d win the game. They tried to play conservative, but we play a different way. We play a hard, physical game and take lots of shots. You see the results.” At least one Ranger fan posted on a fan board that the Rangers were getting coal in their stocking for Christmas due to the ending of that game. From that day forward, Caps fans would remember that game as the “Miracle on 33rd Street” game, given that it took place so close to Christmas and the fact that Madison Square Gardens is located between 31st Street and 33rd Street and is about two blocks away from the iconic Macys of “Miracle on 34th Street” fame. The Capitals’ game with the Rangers on December 20, 2015 rekindled many of those memories as that particular game was also in Madison Square Garden, featured the Caps getting into an early hole, and Ovechkin scoring an important goal as the Caps went onto win. During the first intermission, Becca, one of the writers at Japers Rink, tweeted that she felt a Caps comeback, similar to that game, was going to happen. Her prediction was correct. This entry was posted in Games, History and tagged 2008 Season, Brent Johnson, Diane Doyle, Jose Theodore, Miracle on 33rd Street, New York Rangers, Shaone Morrisonn, Viktor Kozlov. Bookmark the permalink. Thats an impressive factoid, Michael.